109 min [ It isn't love that makes the world go round. ] 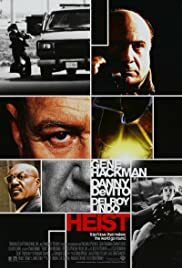 - Veteran thief, Joe Moore (Gene Hackman), is a pro who has done his last job. Now he just wants to get out of the business and sail off in to the sunset. But with his "fence", Bergman (Danny DeVito), holding back on the money from the last robbery, Joe and his team are not going anywhere - not until they pull off the mother of all heists. To ensure Moore and his team do the job his way, Bergman is sending his young, arrogant nephew, Jimmy Silk, to oversee it. With little respect and a thin veil of trust hanging over the job, pulling off the heist is the least of Moore's fears.